iPhone 6: Will Apple Deliver a 1080P HD Retina+ iPhone? With increased competition from smartphones like the Samsung Galaxy S4 and HTC One, with 1080P HD displays, Apple may feel the need to step up to a Retina+ resolution for the iPhone 6. Apple’s next iPhone, the iPhone 5S will likely feature the same Retina Display as the iPhone 5. Tim Cook even said as much in a call to investors earlier this year. But there are rumors that Apple is experimenting with a higher resolution Retina display for the iPhone 6 and rumors that Apple is also experimenting with multiple iPhone 6 prototypes and concepts. Apple is rarely quick to jump on trends in the Android smartphone market, but as devices like the Samsung Galaxy S4 and other high resolution smartphones tempt users with great looking displays that offer room to use multiple apps and to view movies in HD in a user’s pocket, Apple may not be able to ignore the push. Apple planning a Retina+ HD resolution for the iPhone 6 makes sense give the company’s desire to avoid screen fragmentation. By pushing a higher resolution, larger display out to 2014, the company could address many of the issues with bringing in new screen sizes. Here is how and why Apple could deliver an iPhone 6 with a higher resolution and with multiple display sizes. The iPhone 6 prototype rumors talk about an iPhone 6 concept with a Retina+ Sharp IGZO display. While Peter Misek did not elaborate on the resolution for such a display, it would certainly need to step up to HD to make the change worthwhile. At CES 2013 we took a look at a Sharp IGZO smartphone with a 5-inch display and a 720P HD resolution, as shown in the video below. Sharp and Apple are rumored to be working together to bring IGZO technology to the iPhone, likely with the iPhone 6. While this example shows an 720P display, if Apple plans to add a new resolution to the mix, odds are the company will jump up to 1080P. By opting for a Sharp IGZO display in the iPhone 6, Apple could help deliver a more power efficient display that offers better looking images and better touch responsiveness. Apple may be interested in this technology, specifically a 5-inch smartphone display that lets users write with a pencil on the display. We first saw this technology at CES 2013, as shown in the video above, where a Gotta Be Mobile editor is using a regular pencil to draw on a Sharp IGZO display. Apple could choose to deliver a higher resolution iPhone 6 with a larger display, and Apple could also continue to offer an iPhone 6 with a smaller display. The naming convention may see a tweak, but this dual iPhone option would allow Apple to meet the needs of users looking for a larger iPhone 6 with an HD display and to satisfy users who want a smaller iPhone. 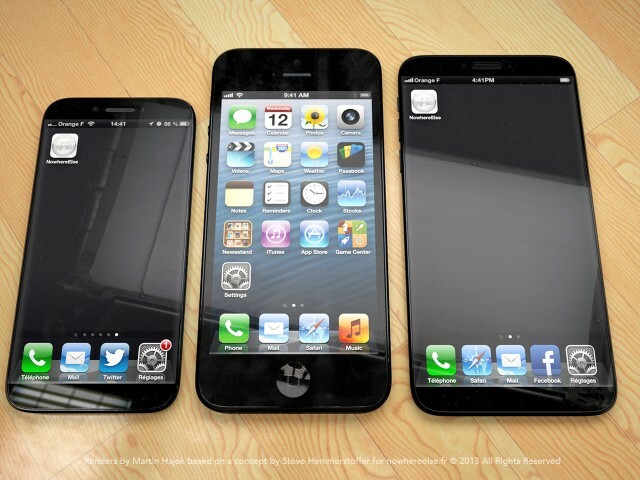 This image shows how Apple could deliver an iPhone 6 and a larger iPhone 6. There is a possibility that Apple could segment these devices to deliver a faster processor and newer features in one form factor, while keeping the other device on older hardware. We’ve covered multiple ways Apple could deliver two iPhone devices, one with a larger screen. In this example we look at an iPhone 5S and a larger iPhone, but the same principle applies to an iPhone 6 launch. If Apple delivers an HD display for the iPhone 6, which odds are they would call Retina+ Display, the company would want to avoid complicating app development and the overall ecosystem. By the time an iPhone 6 is likely to arrive in 2014, Apple would likely feature an iPhone 5, an iPhone 5S and an iPhone 6 possibly with two screen sizes. With this setup, the iPhone 4 and iPhone 4S would no longer be sold at retail and the iPhone 4S might be the only non-4-inch display iPhone on iOS 7 or iOS 8. This natural shift of the iPhone product lineup, makes room for Apple to introduce the larger screen size and a larger resolution without nearly as much fragmentation as either of these changes would make this year. Apple is good at avoiding fragmentation, but at some point the company must make changes. As we saw with the iPhone 5’s 4-inch display and Lightning connection, the market adapts fairly quickly to changes in Apple products. Apple is already making iPhone 5 compatibility and Retina resolution mandatory for new app updates, to spur developers to support the larger display. obviously not apple knows their customers are too stupid to want a better phone and that they will buy the same garbage year after year. 1080p in iPhone 6? That would be super awesome!